We carry the Haivision Makito X. 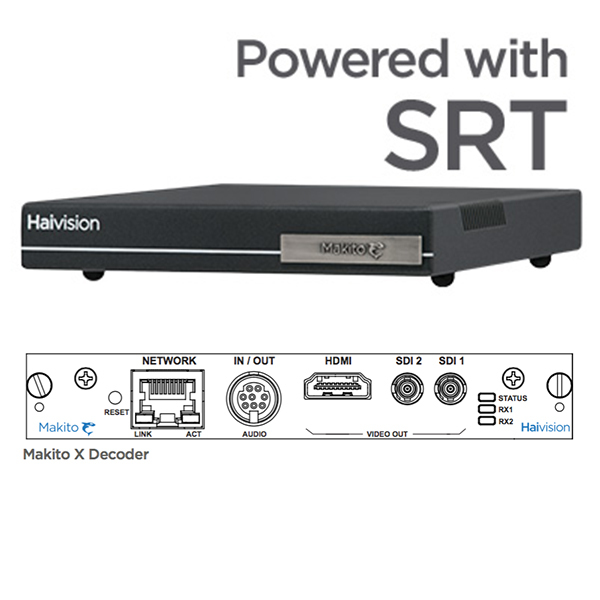 The Makito X encoder transports secure, low latency, HD video over any network at extremely low bitrates. Available as an ultra compact SDI or DVI appliance with optional internal or removable storage, or within a high density 1RU (6 blades) or 4RU (21 blades) chassis. The Makito X is ideal for live, interactive and headend applications. With up to 2 inputs and 4 encoding engines per blade, the Makito X carries forward the strong heritage of the Makito family with features designed to address the most rigorous video applications. The excellent picture quality at low bandwidth and the lowest end-to-end latency of the industry makes the Makito X platform ideal for internal broadcast applications. Combining KLV and CoT metadata support makes the Makito X ideal for Full Motion Video (FMV) applications in government and military. Moreover, integrated features such as snapshots, logo insertion, Selective MuteTM, talkback, and powerful control interfaces enable advanced video network management in medical applications. Multi-bitrate (MBR) encoding to unicast, multicast, and RTMP enables administrators to direct many unique streams groomed to specific desktop and mobile viewers, set-top boxes, recorders, and Internet destinations. Haivision systems are designed for secure media delivery to displays with full administrative control so educational institutions can establish one media system that works across all platforms. 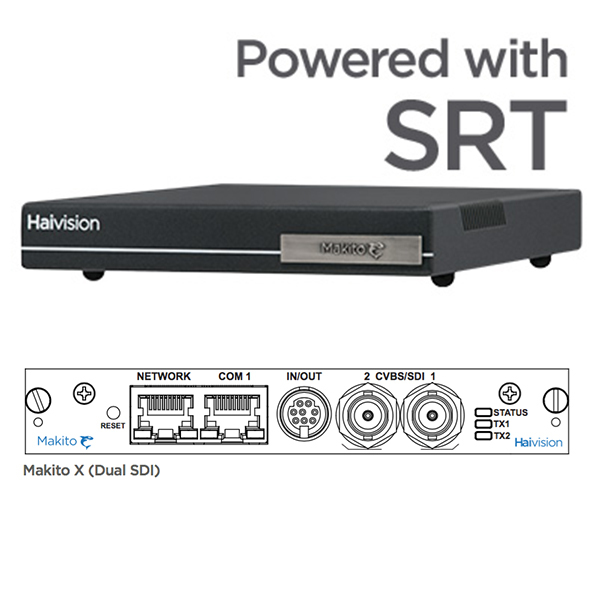 The Makito X delivers highly efficient encoding, with up to twice the quality within a given bandwidth or savings of up to half the bandwidth for the same quality compared to industry-leading encoders. With stream quality that is on par with broadcast-quality encoders at higher bitrates, the Makito X encoder delivers pristine quality at bitrates lower than 2Mbps – ideal for Internet or satellite transport of video. 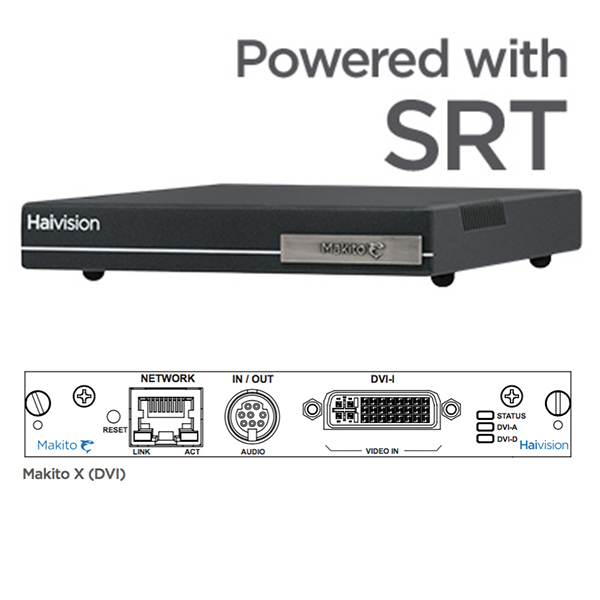 Haivision’s Secure Reliable Transport (SRT) technology provides end-to-end security, resiliency and dynamic endpoint adjustment based on real-time network conditions to deliver the best video quality at all times. With SRT, you can optimize video streaming across unpredictable networks, like the Internet, by assuring quality-of-service when faced with packet loss, jitter, latency, and fluctuating bandwidth. 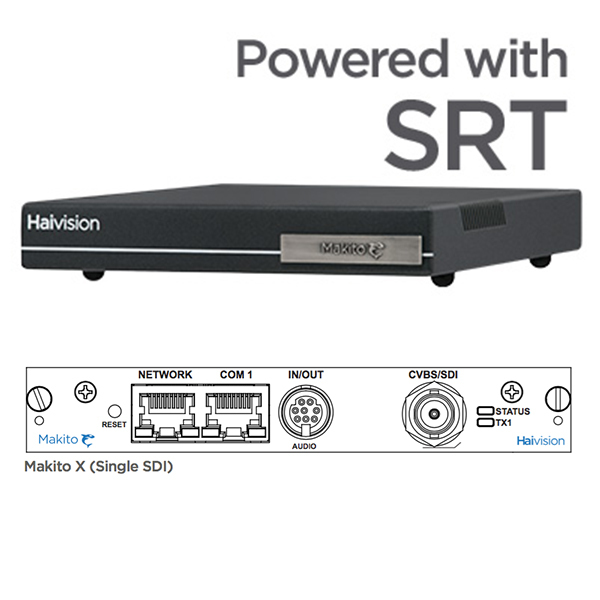 Available within the Makito X encoders and decoders, SRT offers significant operational flexibility and cost savings over (or compared to) satellite or custom network infrastructures. Safeguard your content, regardless of network conditions. With 250GB of internal or removable solid state drive options and multiple encoding cores, you can stream live, HD video at the lowest bitrates for bandwidth constrained applications, while recording days of HD video directly on the Makito X appliance. Storage options are available on all standard Makito X blade flavors. With an extremely low encoding latency and complete audio and video synchronization, Makito X delivers rich media for your daily communication or mission-critical distribution needs. The Makito X encoder can be paired with the InStream performance player to service desktops, laptops and mobile devices. With 4 internal encoding engines, the Makito X can encode video at up to 4 different bitrates and profiles for multi-bitrate (MBR) streaming to optimize video distribution. Each engine can be directed to multiple network destinations concurrently – unicast, multicast, TS and RTMP – to serve desktops, mobile devices, set-top boxes, signage players, recorders and streaming servers. For remote installations or headends, the Makito X encoder offers highly flexible configurations, available either as an ultra compact appliance with optional internal or removable storage for dual channel requirements or within a 1RU (6 blades) or 4RU (21 blades) chassis. For harsh environments, the Makito X is also available in a fanless chassis designed for high temperatures applications. If you want more information about the Matrox Exito, please call us at 914-777-3615, email INQUIRY@ITPROS.COM or click the button below to be redirected to our contact page and fill out one of the forms.